The Newcastle leg of the ninth annual ENGEN Pitch & Polish programme was held on Saturday, 1 September, the first time the event has been hosted in the city since inception. This national entrepreneurial workshop and competition – hosted in partnership with Engen Petroleum Ltd, Nedbank, Raizcorp and Caxton Local Media – has helped over 10 000 entrepreneurs improve the way they pitch their businesses to potential investors. “Engen Petroleum is committed to playing its part in helping to develop the economy of SA. One of the initiatives that we use as a vehicle to achieve this is the powerful ENGEN Pitch & Polish programme, as it aims to assist local communities transform their business ventures, with the potential to create jobs. This exposes entrepreneurs to enterprise development training and critical thinking skills that will help them grow their business ideas,” explains Thandi Ngxonga, Process Safety Specialist, from Engen Petroleum Ltd. The day’s winning formula saw Justin Cohen (best-selling author and international speaker) motivating the crowd about the value of delivering a polished pitch. The workshop aims to teach participants about how to develop a well-rounded and investor-ready pitch. The interactive nature of the event ensures that everyone participates while learning at the same time. At each event, five contestants pitch their businesses while the facilitator and attendees offer guidance, advice and direction to help shape the pitches. “This is where entrepreneurs are grown, and it is entrepreneurs who will grow this country, solve problems and create employment,” enthuses Cohen. For example, through Charity Modise and her events business, the delegates learned that sometimes what entrepreneurs need is clients and not necessarily funding, and also how important it is to do research into your competitors and their offering and tools. Sikhumbuzo Nkosi, with his labour law consultancy, presented a strong pitch. However, what he and the audience learned was that using a variety in pace and tone would help to make his pitch more impactful and easier to follow. There is credibility in sharing successes and achievements which demonstrate the consultancy’s strength. Sharing one’s accreditations can also be a powerful tool, as seen in the pitch of Ntombi Nkosi, a geological consultant. You need to explain the differentiating factor in your business and be very specific about your finance model. It’s important to explain a complex industry in a way that makes sense to a potential investor. The feedback that Zamaswazi Khulu received was to clearly explain her environmental consultancy business by defining its value. A business that offers a product or service that is in high demand yet has low supply is music to the ears of an investor, but you need to be sure to back up your claims with stats and facts. The winning pitch was delivered by the wild card entry of the day (someone who is chosen by the audience). Riaz Kajee has a tech-focused courier business model and his pitch illustrated a clear business model and had a relatable story. His pitch reflected the learnings from the day and was well structured in its delivery. This country needs entrepreneurs who get up every morning and grind, as it is through entrepreneurs that the economy will be buoyed. To pitch effectively, knowing your financials in detail is what will set you apart. Insider tip: Paraphrase what the investor has said back to him or her as this shows that you have understood what they are saying and helps build a connection and rapport. Entrepreneurs are really pitching their purpose, and investors buy the ‘why’ you do what you do, the value and the benefits and not necessarily the ‘what’ or features of the product or service. 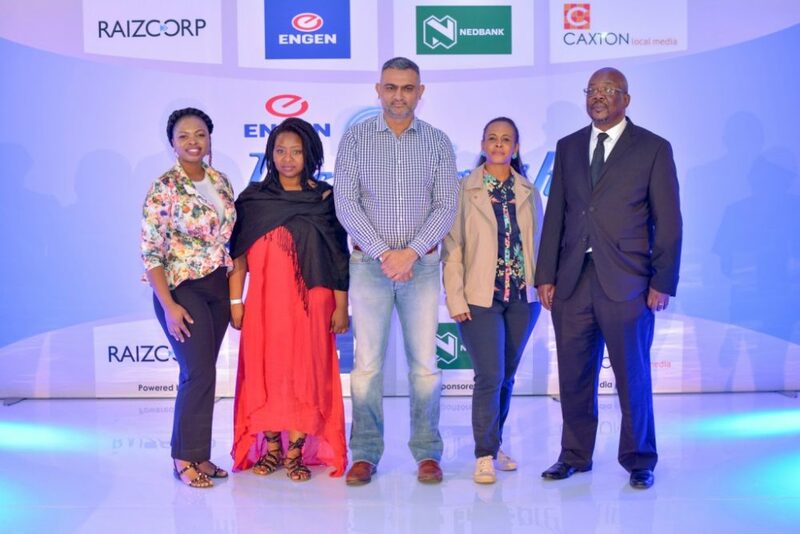 As the 2018 winner of the Newcastle leg of ENGEN Pitch & Polish, Riaz Kajee won R6 000 and a week of training at Raizcorp in Johannesburg worth R150 000. He also has the opportunity to progress to the semi-final and become the ultimate 2018 ENGEN Pitch & Polish winner and receive further cash injections and other prizes.